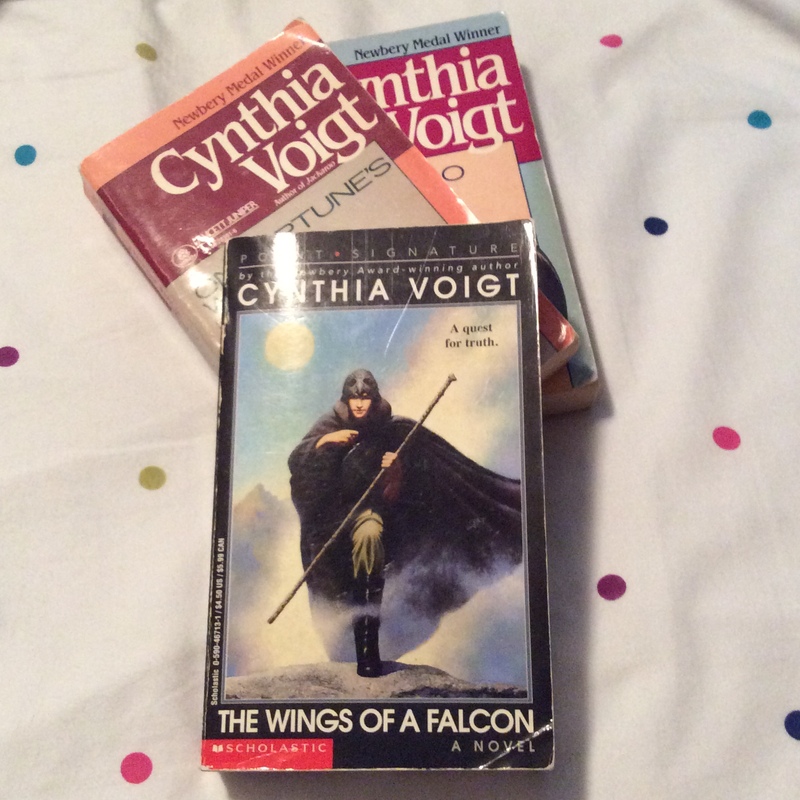 The Kingdom series of books by Cynthia Voigt was a favorite of mine in my teen years and I’ve decided to revisit them to see if they are still as great as I remember. The four stories, Jackaroo, On Fortune’s Wheel, The Wings of a Falcon, and Elske (sadly, many of the names have now been changed when they were reissued with new covers, but stories are the same, I hope) are loosely connected, being set in and around a kingdom somewhat like a medieval English or European kingdom. Jackaroo stood out to me at the time I read it, because there’s not any magic in it, yet there’s something magically remote about the Kingdom. Jackaroo is actually my least favorite in the series. My favorite was always On Fortune’s Wheel as it’s an adventure/romance, but The Wings of a Falcon is a very close second, and I always think of that book being the masterpiece of her series. Elske I’ve only read a couple of times and don’t remember much about it. It never seemed to fit as well with the original trilogy of stories, but as I read through them again, that view may change. With this recent rereading of Jackaroo, I understand now why although I liked the world, I didn’t like the story as much as the second book: Teenage girls tend to crave romances, and although there is a love story in the book, it’s far from the focal point. But I realize now that the love story, quiet as it is, is actually fantastic, but something my teen self was just not into at the time. Burl seemed so unsuited for the heroine, Gwyn, being a servant and often described from her point of view as someone who is just always there and pining away for her sister who won’t have him. Plus, he didn’t talk much. Now, firmly an adult, I can see the quiet strength he gives her, helping Gwyn to be Gwyn. And, isn’t that often what people want in a romantic partner? Just someone who will have their back and be invested in them? Gwyn eventually realizes this and is happy to be with him in the end. What really caught my attention the first time around, though, was the possibility of adventure, because Jackaroo is a hero of the people, much like Robin Hood or Zorro. Like Zorro. Although Jackaroo’s past and rumored deeds are mentioned in the book, it’s not a rousing tale of adventure like I had wanted: The book offers more than that. Gwyn is an innkeeper’s daughter, a spirited girl and a hard worker, capable in a way the rest of her family are not, and determined never to marry. Because her family is better off than some, they have to endure constant mutterings against them, something that I’m sure any successful person will recognize. And no matter how much the successful people give back to those poorer than them, it’s never enough. Ruling over everyone is the king, the earls, and the lords. Gwyn has a heart for the people and how especially the lords’ boots press heavily upon them. The laws the lords have put in place aren’t really to serve justice, but merely to serve the desires of the lords. It’s a situation common as mud, which is why tales like Robin Hood and Zorro resonate so much. Won’t someone give the people a break, already? When a lord and his son require a party to join them for a mapmaking excursion north in the dead of winter, Gwen and Burl end up being their guides. In a blizzard, they get separated and Gwen and the “lordling” as she calls him, end up snowbound for weeks in a hut not very far from the inn. Gwen is at first resolved to keep up appearances and treat the boy as if he were her master and she his servant, but as time passes and boredom ensues, the pair become friends and both are able to see the opposite class as human. The lordling even teaches her to read, something that is forbidden to regular people. After the winter, the injustice in the Kingdom eats away at Gwen, and when she finds a set of clothes that seem exactly like something Jackaroo would wear, she takes up his mask and pretends to be him, doing good deeds as she can, not fully realizing how much danger she is in by her actions. Burl sorts it out and she falls for him largely because he, too, sees the injustice and wants to change it, but it’s enough for her that he merely sees it, really sees it. In fact, Gwen discovers quite a lot of people admire and even want to be Jackaroo, because Jackaroo is outside society and can be a catalyst for positive change. Although Jackaroo doesn’t feel dated in a bad way, there’s a distinct 1980s feel about the story and the writing. It was published mid-decade and the world is sometimes akin to The Princess Bride or Willow (minus the magic), and a little connected to Pretty in Pink or The Breakfast Club (class differences, rich and poor). It’s a classic in a similar way that those movies are classic. There’s nostalgia for those who lived in the 80s, but also something new to learn upon subsequent readings. I’m so glad that I reread Jackaroo and gained a new appreciation for the many layers of the story, Gwen’s concerns, the love story, the politics, the history, the keen insight into human nature, and so on, and I can’t wait to get started reading On Fortune’s Wheel. The world of the Kingdom would be fairly easy to adapt to screen if anyone every got the notion. Cynthia Voigt is a gem of a writer. It’s like people are determined to ruin my childhood or something. Okay, okay, drama aside, let me explain. The books, the books that defined my teenage years for me were, okay, yes, the Anne of Green Gables series, and, yes, Little House on the Prairie, and various teen romance series that were probably too steamy for me to be reading, and Robin Cook thrillers, and Isaac Asimov sci-fi extravaganzas… but I digress. Where was I? The series that I loved, one of those that almost clammer for a screen adaptation, but resolve themselves to staying literature only, was The Kingdom series by Cynthia Voigt. What I loved about the series was mostly the second book, On Fortune’s Wheel, which is terribly romantic, but the third book, The Wings of a Falcon ended up ultimately being my favorite as I got older. Something about two friends making it through everything…it just sticks with me to this day. The first book is Jackaroo, the plot of which at first seems like a knockoff of Robin Hood. And it is, sort of, but the world of The Kingdom, quiet, contemplative, and somewhat melancholy, draws you in. The series just has this rare quality of making the reader feel like you are there. You are going through this, too. This quality is likely why Voigt is such a successful writer of young adult stories. Anyway, I learned today, just in looking up the series to see if I wanted to buy newer copies, that um, they’ve changed the titles. All of them. Well, the fourth book, Elske, is now The Tale of Elske, and it’s my least favorite of the series, so that one didn’t disappoint me too much. But the others! I just can’t believe it! Jackaroo, On Fortune’s Wheel, and The Wings of a Falcon have all been changed to The Tale of Gwyn, The Tale of Birle, and The Tale of Oriel. Three wonderful, intriguing titles exchanged for stupidly bland titles that fail to reflect the fact that The Kingdom books, although set in the same world, aren’t sequels, aren’t part of a large, overarching quest or plot, and are each really their own stories almost entirely. It’s almost as stupid as changing D.M. Cornish’s awesome series title Monster Blood Tattoo into Tales from the Half-Continent. Why do publishers or authors or whoever do this? Blander titles are supposed to sell more books? Really? It would be like me changing my series, Trolls for Dust, to Vale Studios. Boring! Now, if they’d changed them to more interesting titles, I would maybe be on board, but this… Well, my childhood is long over, anyway, and one can’t go back, not really. My memories of those happy reading days will have to suffice. I will treasure my dog-eared original titles and refuse to replace them unless they become absolutely unreadable due to wear and tear. This winter I want to read the entire series again and go through for you what I love about it and why you or your teenagers might like it too. They will be the same stories, despite the names being changed, but I disagree with Juliet. Names of things matter. Names show identity, they show who you belong to, who loves you, sometimes who hates you. Names can be blessings or curses, beatifying or insulting, and changing a book’s title is no small thing, just like changing one’s own name is no small thing. It is a transformation no matter how one looks at it. The object or person is simply different after. Most of the time, I hope, for the better, but this required a rant because the original titles are infinitely more suitable for the series, and the new titles woefully inadequate. And don’t even get me started on the new covers. The covers and titles I grew up with. This is an older series from the 1990s, but it’s a beautiful, fantasy-type world without magic, and has been one of my favorite series since high school. The themes and story lines in the books are geared towards an older Young Adult audience. The novels are all loosely connected and set in a fictional “Kingdom” and the countries that surround it. The world is medieval, with kings, earls, puppeteers, and so on. The first of the series, Jackaroo, has a “Robin Hood” plot involving a heroic figure who steals from the rich to give to the poor. Although an engaging story, it’s my least favorite in the series. My two favorites are On Fortune’s Wheel and The Wings of a Falcon. The first is a typical romance/adventure where girl meets boy, girl falls for boy who doesn’t at first care for her, etc., but it’s not a love easily won, and therein lies the story’s strength. The Wings of a Falcon involves the quest of a young man looking for peace. He starts out as a slave imprisoned on an island and breaks free, taking another boy with him. The book is full of action, some romance, a tragic yet happy ending, and has an epic scope built for the big screen. With names like Oriel, Griff, and Beryl, it fits nicely into a fantasy genre, but again, without the use of magic as a trope. The standout here is Voigt’s writing, which is notable because one doesn’t note it while reading. One can become completely involved in the story, and that is the point. No ridiculous metaphors (I have to battle this in my own writing), or effusive descriptions, just good, clean storytelling. Modern YA is plagued by “purple prose” possibly because so many of us are going the self-publishing route, but professional writer that Voigt is, she has none of those problems. Why this could be the next Harry Potter: The stories in the series can appeal to both teens and adults. The “Kingdom” world is adaptable to the screen and invites the possibility of many more stories set in the same world. The settings evoke the romance of nature, from woods, to mountains, to sea. The heroes/heroines in the stories are sometimes childish due to their age, but they are “young adults,” with the emphasis falling on “adults.” The Kingdom world is closer in gravity and themes to The Lord of the Rings and the later Harry Potter books, and is also not a true “series” as the novels take place in some cases generations apart. Still, the tales offer much “scope for the imagination,” as Anne of Green Gables (I’d love to see this series remade!) would say.